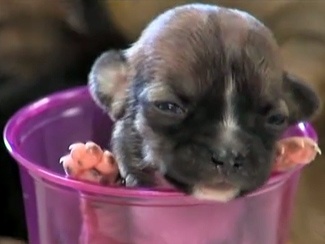 A diminutive Sacramento, Calif. puppy has escaped death four times – against all odds. The dachshund mix, named ‘Beyonce’ will go up for adoption in the near future. The Grace Foundation of Northern California, which rescued the dog’s mother from Devore Animal Control, says it has submitted an application with the Guinness Book of World Records: they believe that Beyonce could be the world’s smallest dog. I hope that people will consider getting another dog if they can not get her. She is cute. What a cutie and also an inspiring story. I’m sure that they will be bombarded with requests from people who want to “Put A Ring On” little Miss Beyonce. Ditto on the hope that all of those who want Beyonce will adopt one of the other homeless animals should they not get her. That was my first thought this morning when I saw her on GMA. She is way too young to be passed around like that and exposed to everything. Hope she don’t wind up like that little rabbit with no ears, camera man accidentally stepped on it……..now no more rabbit. I watched this earlier. Why not wait a few weeks and let her mature and develop an immune system? Need to let her be and not promote other unscrupulous breeders to try to replicate her. She is precious however it is irrespnsible and dangerous to be exposing her like this! awww poor baby i totally agree the poor thing might go into shock!! 2 weeks old is much too young for travelling along and being passed along like that. I don’t know that the birth weight counts as a record. she’s adorable, but I hope that people realize there are many, many dogs that need rescuing. Some may not be as cute, but are as thankful and happy to go to a forever home. Thank you for saying that! I thought the same thing. She is shivering and how many more objects are they going to place her with to show off her size? We get it already. Ugh. Can you imagine the anxiety of the mom being hauled all over with a new litter?! Why do they carry that little puppy around?!?!??! She needs to be with her mom and siblings, she is way to young to be hold in so many different hands!!!! Let her be a puppy and not an accessory!!! the puppy is in wonderful hands ‘yes subjecting that pup at that age is not the greatest idea yet it exposed an amazing animal rescue organization in northern California the Grace foundation. little puppy is in safe hands thats what matters ‘ right folks??? Adorable. May she have a long, healthy, happy life. YES exactly what I was thinking today when I saw her on national television!! Come on, people…stop exploiting animals for financial gain!!! That puppy needs to be rescued from the rescue she is in! i agree with you ……she should be resting not be shown on tv….. Agreed, I told my husband the same thing-too young and fragile to be put on an airplane and be handled by so many people.